Cross rib roast can be a tough cut of meat, but when cooked properly can be a totally mindblowing dish! What is a beef cross rib roast? The cross rib roast is also known in some parts of the country as Shoulder Roast, Arm Pot Roast or Chuck Shoulder Roast. It’s a chuck or shoulder portion of the meat. It does tend to be a tougher cut, so low and slow is the way to go here. You can make this beef cross rib roast recipe in the oven following the steps below (to ensure maximum tenderness), or in a slow cooker. Lately I’ve been spending so much time getting our new house set up, that I haven’t done a whole lot of cooking. A lot of my gadgets are still packed away. Yes, I know we’ve been living here a month but these things take time …right? 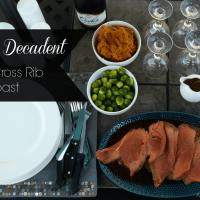 Anyway I wanted to share with you a recipe for an absolutely mouth-watering beef cross rib roast that is practically effortless. It tastes amazing, and requires very little prep but will taste like you spent hours fussing. Its perfect for when you have guests, or even just a nice, cozy dinner alone. As much as you will want to share this recipe, I have no doubts you will covet any remaining leftovers…if there are any! This recipe might look familiar to you…if you guessed it’s the recipe for Chex Mix, you would be correct. It just so happens that the typical “Chex Mix” seasoning works fabulously mixed into ground beef for burger seasoning. So far everyone I have made this for absolutely loves it in burgers and as a rub on a roast. It adds some wonderful subtle flavors, without it being super obvious what the spice blend is. If you’re pressed for time or you’re short ingredients, you can use the Chex Mix packets like I did (I happened to have a few on hand). If you’re using the long version recipe, please note that I doubled the standard recipe. 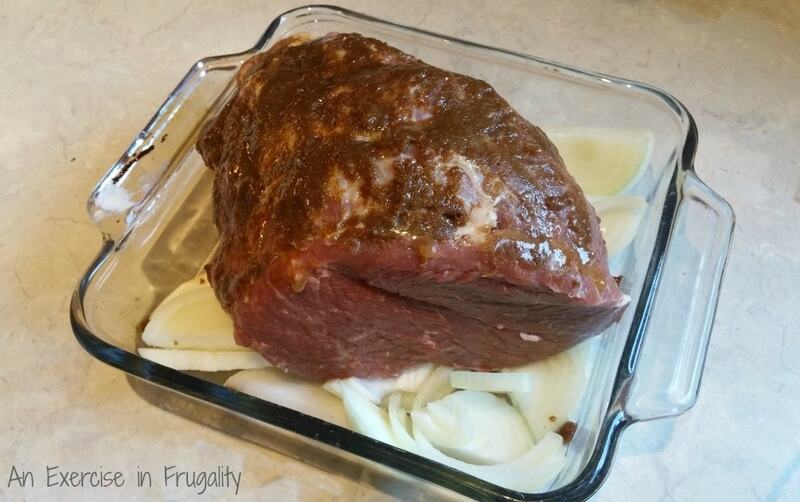 If you’re using this recipe for the rub, the doubled version covers about 3.5lbs of roast. If you’re mixing it into burgers, I recommend about 1 single recipe for 1lb of ground beef (so the recipe shown above would be best used in two pounds of ground beef, depending on your taste buds). 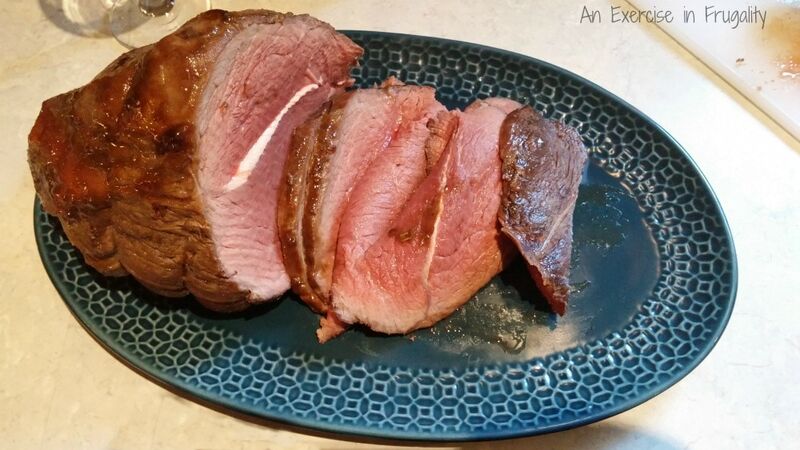 For this recipe I used a 3.5lb cross rib beef roast. You could use any similar roast of your liking. Just make sure to adjust cooking time as needed for a different size roast. 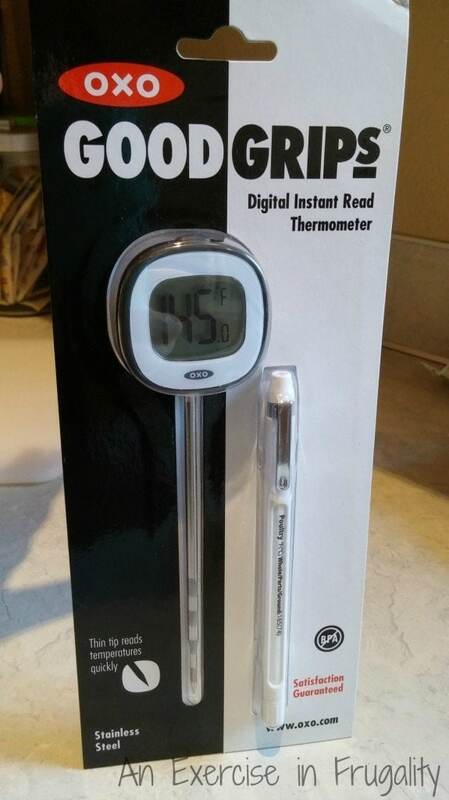 I also highly recommend a digital beef thermometer such as this one from Oxo. Rough chop one medium onion and spread across the bottom of your roasting pan. 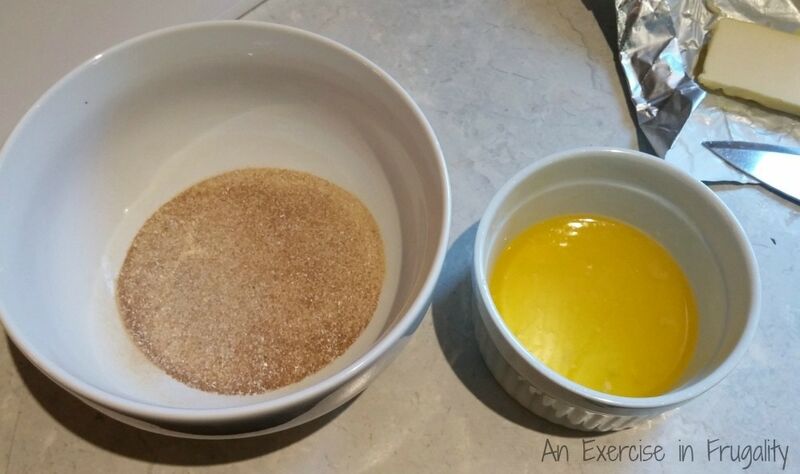 For this simple, yummy rub, you simply take your seasoning mix (whether freshly prepared or the store-bought packets) and mix with 6 tbsp melted butter. Spread all of it liberally around your cross rib roast. 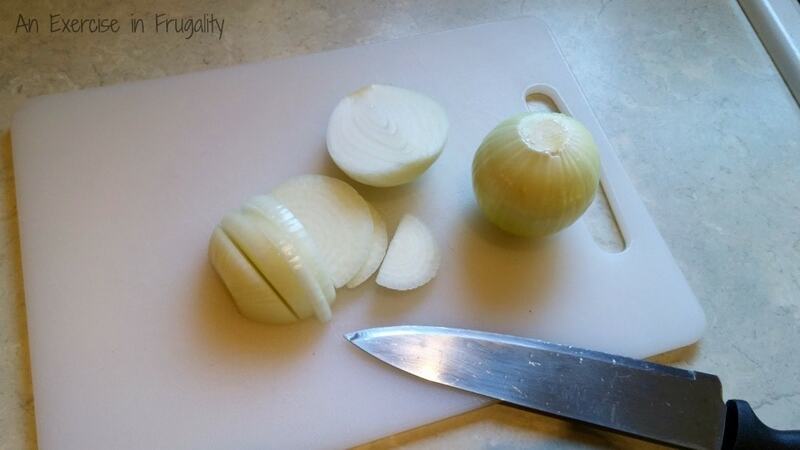 Rub it into the meat firmly, and let sit for a few minutes atop its bed of onions. Wipe the sweat off your brow, you’re doing great. 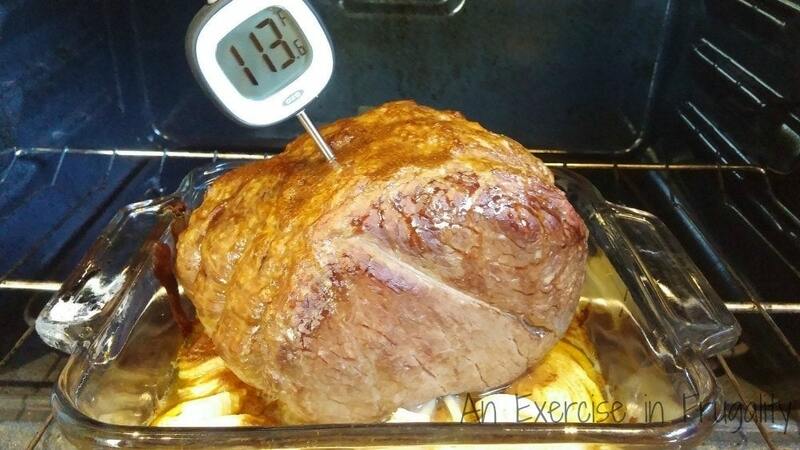 Place the roast in the oven at 450 degrees for 15 minutes, then drop the temperature down to 350 degrees for about 40-50 minutes until the internal temperature in the thickest part of the roast reads 125 degrees. Check with your handy meat thermometer. How did I made it 30 years of my life without owning a meat thermometer? With a lot of dry, overdone roasts, that’s how. 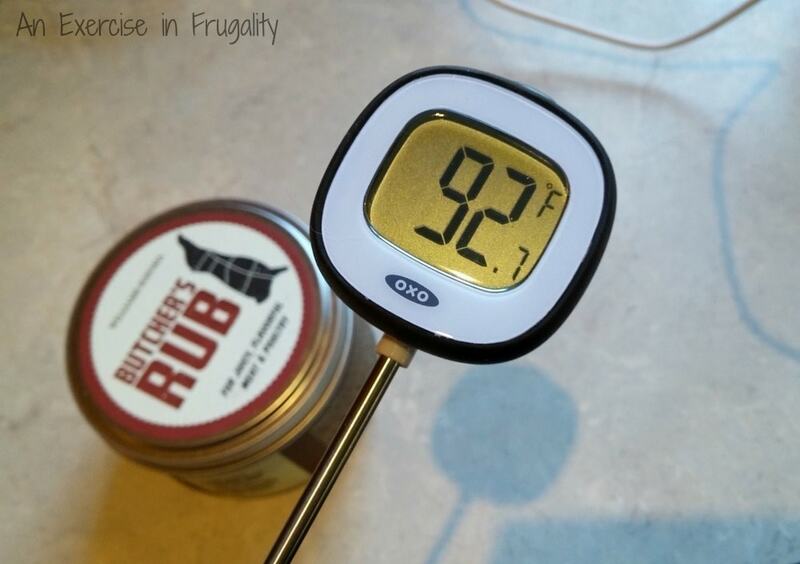 While you’re waiting, do the mature adult thing, and check the temperature of your hands using the meat thermometer. Remove from the oven and tent loosely with foil once you reach the proper internal temperature. Let sit for 15-20 minutes before slicing. 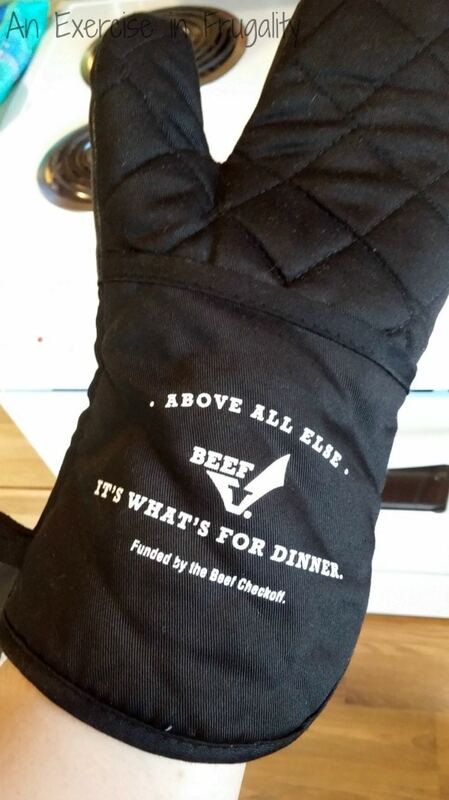 Use your handy dandy Beef Checkoff Oven Mitt if you have one….Because beef is what’s for dinner. 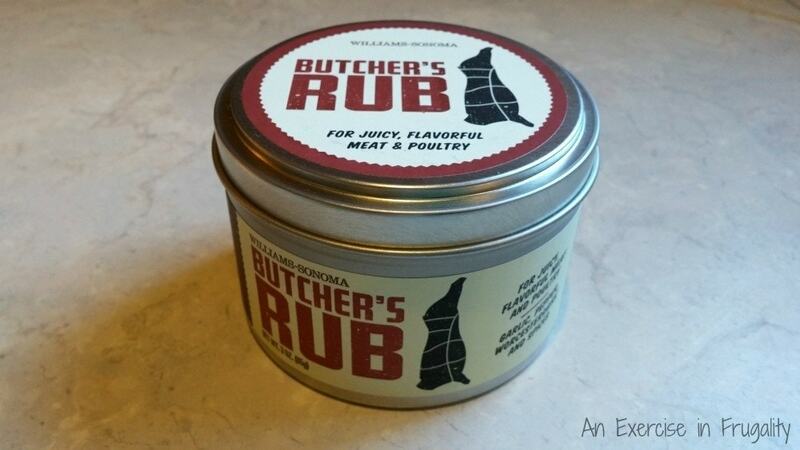 Next time I make a beef cross rib roast, I am going to try this Butcher’s Rub from Williams-Sonoma. It starts out with some of the same seasonings as this recipe, but then kicks it up a couple notches. I can’t wait to try it! In the odd event that your guests don’t polish this off and lick their plates, any leftover meat (and the juices) can be used for some amazingly tasty french dip sandwiches, or sliced up cold on a salad. I love dishes like this Beef Cross Rib Roast for when we have guests because its no fuss. 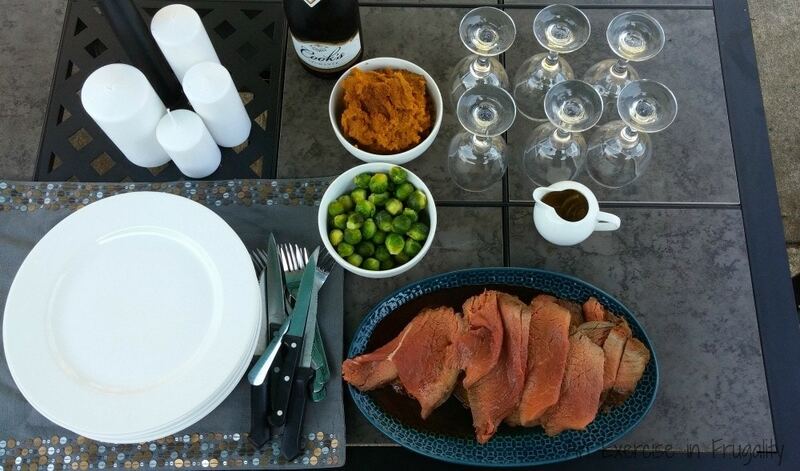 You can do the prep before the guests arrive. 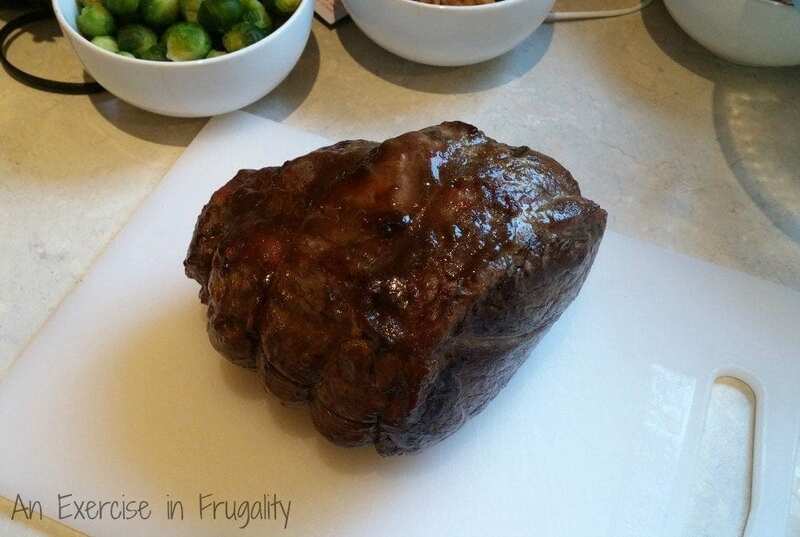 You can even put the roast with the rub on it in the fridge (wrapped of course) until you’re ready to pop it in the oven. This way, when your guests come, you’re not spending hours slaving in kitchen and you can actually enjoy your company, while still providing a meal that is sure to impress. It’s really simple to prepare this beef cross rib roast, and it was a huge hit with our guests! This recipe works just as well in a slow cooker! Simply sear the meat in a hot pan, then place in the slow cooker along with the seasonings above and a cup of water or beef broth. Cook on low for 8-10 hours or until fork tender. If you’re looking for more great beef recipes, don’t forget to check out Beef-It’s What’s For Dinner. 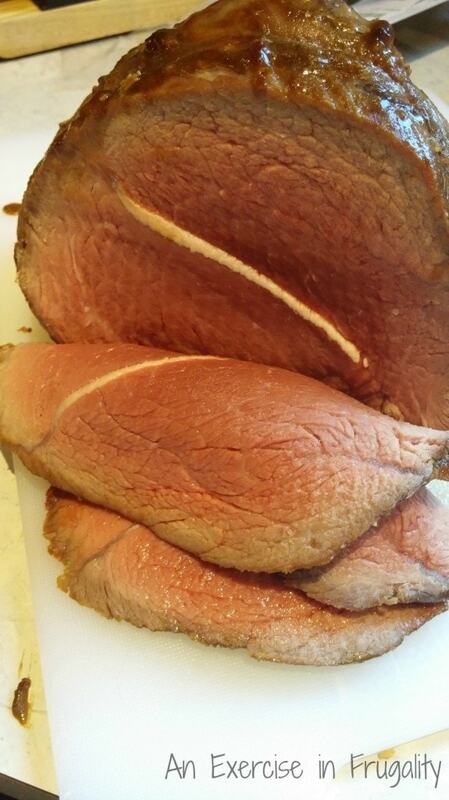 Lots of great recipes and preparation tips for one of my favorite meats. Some awesome advice for grilling beef too! Did you know that beef has 10 essential nutrients? 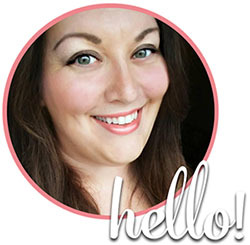 We’ve been eating a lot of beef since we started our low carbohydrate diet. Protein is such an important part of our lives, and the iron in red meats help me keep my anemia in check, which means not feeling tired and run down all the time. Plus of course, beef is delicious and can be prepared SO many different ways. What side dishes should I serve with a beef cross rib roast? We had some amazing roasted brussels sprouts and sweet potato casserole but this au gratin zucchini makes a fab side also! To really kick things up a notch, be sure to serve your guests this unbelievable artichoke crab dip. Sounds weird, but it’s out-of-this-world good! Find more of our great, easy recipes here! The Beef Checkoff was established as part of the 1985 Farm Bill. It’s a national marketing and research program funded by America’s cattle farmers and ranchers. Who directs the Beef Checkoff? Cattle farmers, ranchers and importers direct the national checkoff program, which uses funds toward research and promotion efforts designed to increase domestic and/or international demand for beef. The Cattlemen’s Beef Board and USDA oversee the collection and spending of these beef checkoff funds. What’s the National Cattlemen’s Beef Association? The National Cattlemen’s Beef Association (NCBA) is a contractor for the Beef Checkoff and manages research and promotion programs on behalf of America’s farmers and ranchers with oversight from the Cattlemen’s Beef Board and USDA. One of the checkoff programs NCBA manages is the “Beef. It’s What’s For Dinner.” brand. 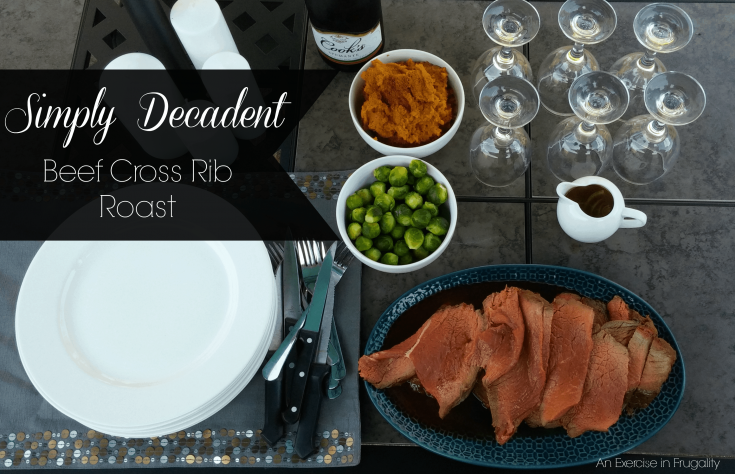 This delicious beef cross rib roast is the perfect easy recipe for holiday entertaining! Tent in foil for 15-20 minutes to rest, then slice and top with juices. Enjoy! 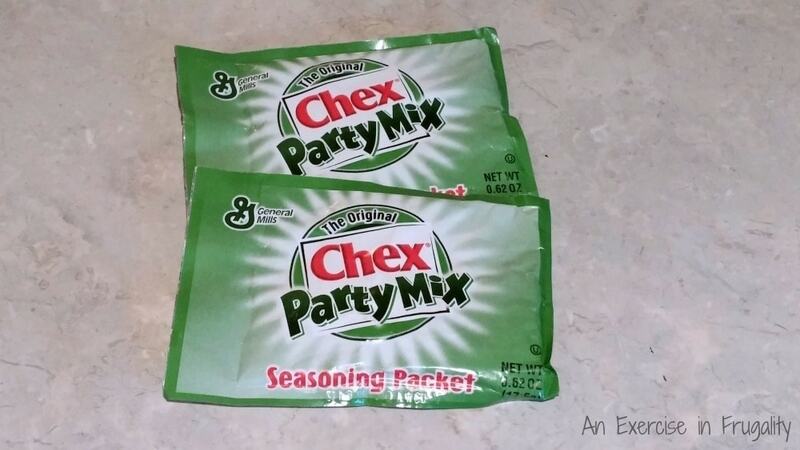 *Optional: instead of above dry ingredients, you can use two packets of Chex Mix Party Mix Seasoning. If you realise at the last second you are out of butter, would a “buttery spread” Kroger Brand vegetable oil spread be ok to substitute? I think it might be okay to use but I haven’t tried it. I’m not sure if it would affect the taste at all. Let us know if you try it!